Not to be confused with the Triple Frontier at the border between Brazil, Argentina, and Paraguay. 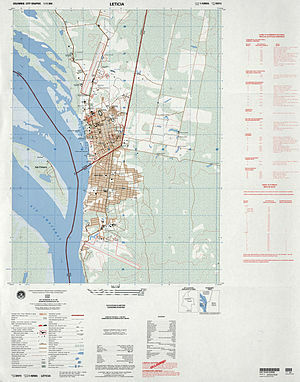 Map of the Tres Fronteras produced by the National Imagery and Mapping Agency. Tres Fronteras (Portuguese: Três Fronteiras, English: Three Frontiers) is the Spanish name for an area of the Amazon Rainforest in the Upper Amazon region of South America. It includes, and is named for, the tripoint where the borders of Brazil, Peru, and Colombia meet. The upper Amazon River flows through the area. The area is noted for its natural beauty. Cities in the Tres Fronteras area include Tabatinga, Leticia, and Santa Rosa de Yavari on an island in the Amazon River.